A fair crowd of local residents turned out on Monday evening to hear the illustrious South African-born Dutch star when she appeared fresh from the Grahamstown Festival at the Civic Centre. Miss Thandi, aka Raymond Matinyana, was born in Port Alfred, but has spent a number of years in Holland. He and his band travelled to South Africa to participate in the Festival, and also for him to come to Port Alfred and put something back into the community. This he has done through holding workshops for those interested in music, and has a number of plans to put into operation once he gets back to Holland. Some of these including the twinning of towns, and also that of schools in the township with those back home. Raymond's visit to Port Alfred was filmed by a Dutch camera crew and will be broadcast on national television in Holland after their return.In addition to the workshop, they have also filmed several areas of Port Alfred, thus encouraging tourism by the Dutch people. The concert started with music by the band - Gina on keyboard, Phosho on drums, Simone on bass guitar, Frankie on guitar, and Emiel on saxophone. In his welcoming speech, the mayor of Port Alfred, Councillor Famsi Hani, welcomed everyone and stressed that the only way to boost the economy in Port Alfred is though tourism. He also mentioned the way in which the Municipality and Rotary in Port Alfred had come together in the establishment of the steel band, and he encouraged the young people to get involved in the steel band. He also said he hoped to be able to send the band over to Holland one day. Next, Miss Thandi made her grand entrance. 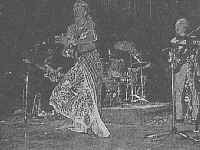 Dressed in a blue head-dress, purple robe, black sandals and eclectic jumble of clothes, she wandered into the audience, which was a little slow in getting warmed-up. However, she soon had them moving to the beat with her rendition of "Iqhira" (more commonly known as "The Click Song"). She also elicited a good number of laughs when announcing she would sing a love song, and proceeded with faultless rendition of "My Sarie Marais". 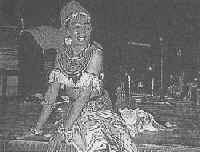 Her programme consisted of African songs from all over the continent, and she explained what the words of the songs meant to the audience. Unfortunately the sound was a little unbalanced, but this was solely due to the necessary sound equipment. As usual, the citizens of Port Alfred came to the rescue, with a number of people rallying around to organise amplifiers, speakers, cables and the like, to prevent what could have been a disastrous start to the evening. Adding a local flavour to the proceedings were a group of backing singers from Nemato township. These five youngsters, headed by Sipho Matthews, go by the name of "The Supremes", and did extremely well, considering they had only spent a while earlier in the day learning the routines. They also entertained the audience with their version of kwaito. The proceeds of the evening will go to the Steel Band Project.